Map showing three North Wales castles. Base map from Image:uk map,svg. Author: Paul at wts.wikivoyage. Wikimedia Commons. Neither John nor Henry challenged the Prince of Gwynedd successfully, and on Edward’s succession in 1272 the prince’s refusal to do homage to the English king resulted in the war of 1276 -77. Edward’s victory was rapid – if, ultimately, inconclusive – but his second war (1282-3) proved more decisive. 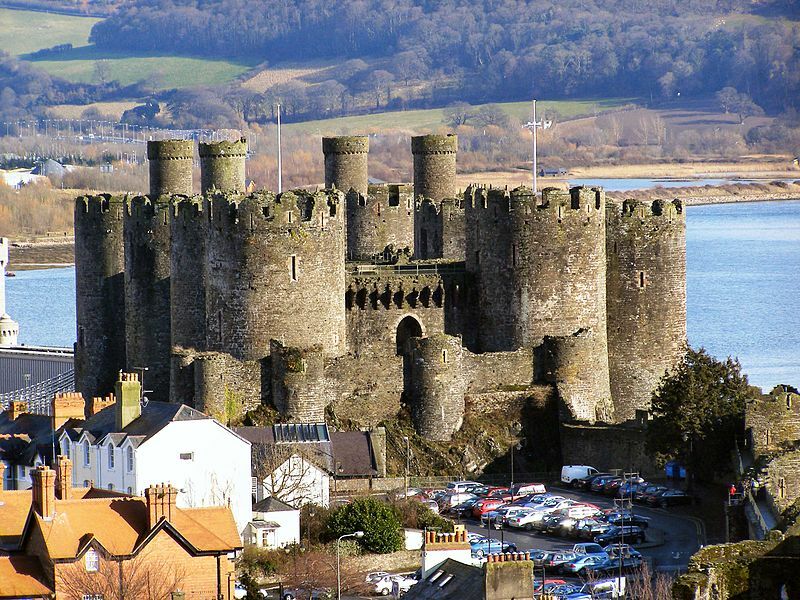 The castle was built as part of a wider project to create the walled town of Conwy in order to control an important crossing point over the River Conwy. The whole project cost £15,000 – equivalent to £45 million today. The castle was intended as a centre for the administration for the area, but Caernarfon became the shire town and assumed that role. Edward only stayed at Conwy once. The plan below shows the castle from the same (south) side as the last picture. The plan is roughly rectangular, with four towers spaced regularly along each side. The bulging outer (south) wall can be seen clearly on each, probably the result of the builders following the contours of the rocky outcrop. The great hall and chapel in the outer ward curves in line with this wall. The four towers closest to the river have small, round turrets overlooking the inner ward, where the royal apartments were located. 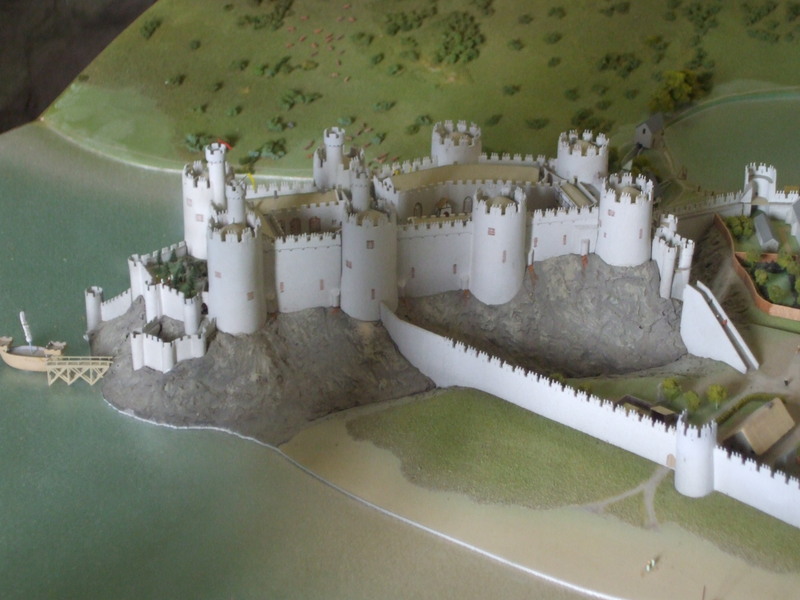 Conwy Castle plan. Source: Cadw. Open Government Licence. Wikimedia Commons. Inside the imposing outer shell the castle contains the most intact set of residential buildings left by medieval English monarchs in Wales or England. 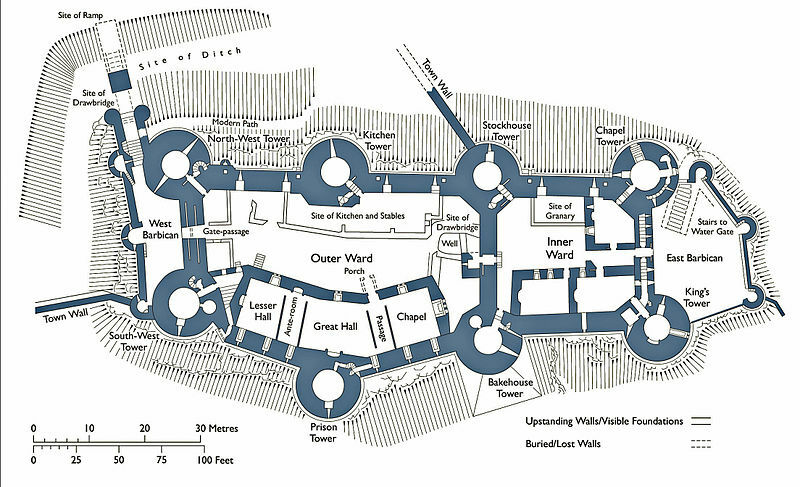 The outer ward – 2/3 of the main castle area – contains the great hall and chapel, as well as the chambers, stables and kitchen that served the garrison. This is the outer ward. The two photos, bottom left are of the great hall and chapel. The chapel is at the far end, where the arched window can be seen. The suspension bridge ascross the R. Conwy (middle bottom) was designed by Thomas Telford and completed in 1826. I’ve missed out so much detail about Conwy Castle, as well as many of the photos we took, otherwise this post would become a marathon. Spectacular!!! Thank you for taking us on a tour. Kudos to you Millie! I’m glad you liked it, Shivangi. Thank you for the lovely comment. Wow, that’s such a beautiful castle! I love castles, but have been to very few of them actually. Will try to visit some this summer when we go to Italy. It was very interesting to see this castle from so many angles. It would be cool to visit there some time. Thank you, Susanne. Conwy is a beautiful castle, as are the others I visited last week. I think if you visit Italian or German castles you would find them very different in appearance to the British ones. Which makes things more interesting, of course. I hope you enjoy your trip to Italy. I’ve been to Sorento and to Sicily, and loved the country. I confess, I had a quick look at your blog, and I think you are in Sweden? I really want to see the site of Viking Birka because it features in my first book. Yes, I’m in Sweden. We actually have a fantastic castle not far from us, Läckö slott. We go to the same place in Italy every year, a small town near Pescara, I haven’t been to neither Sorrento or Sicily but it would be interesting to visit Sicily some time. The first picture itself had me for a minute. The more you gaze at those strong walls and mighty towers, images of fighting armies while the castle withstanding all weapons float in front of the eyes. As I read further you placed characters and warriors in those images. The magnificent strategy and engineering done more than seven centuries ago tell a lot about the genius minds that walked that time. Hi Prateek. I’m glad you like Conwy Castle. I love the place – but then, I’m crazy about all castles! I’ve got two more of the North Wales ones to post about, but I’ll space them out, otherwise it would be castle overload! Like you, my imagination works overtime when I walk round these amazing buildings. They’ve all seen lots of battles and bloodshed in the past. It wasn’t such a pleasant day when we went to Caernarfon Castle, so the photos are rather dull. That will be next. Hi again, snowsomewhere. Thank you for liking all my recent posts! As I said before I went off to Wales, my intention was to visit some of the Welsh castles, and I really enjoyed it. They are really something. As to spending the winter months in them… you’re right, they would have been very cold and draughty. The windows were all just open spaces, and unless you were constantly by the big fireplaces, it would have been decidedly chilly. As for my book, castles weren’t built in Britain in the 9th century. There may have been odd fortresses, as at Dover, left by the Romans, but the Anglo Saxons didn’t build castles, as such. It was only after the Normans invaded in 1066 that castles were built all over the country. Most of those were wooden at first, then they were eventually replaced by stone. Snowdonia is a mountainous region of North Wales – very beautiful and an excellent region for the Welsh princes to mass their forces to rebel against the English invaders. Knowing that, Edward built his castles all around the area. Snowdonia gets its name from the highest mountain in the area, Mt. Snowdon. The name of Snowdon in Welsh means Eryri (derived from the Welsh name for eagle). The Old English name for Snowdon means Snow Hill, so that is probably the name that stuck – Snowdonia is the area surrounding the ‘Snow Hill’. I suppose all mountains have snow on top for most /all of the year. I really hope you like my book. I’ve had a nice surprise today. My inspection copy of my print version of Book 1 arrived – and I love it! That’s such a relief. I can get it onto Amazon now. Wow! Amazing ruins. Thanks for sharing. Wales seems to have lot of castles. Are they just better preserved or did the Welsh build more? A bit of both, I think. They were strongly built by Edward I, who spent a lot of money on them and hired the very best builders and craftsmen. They were all used and lived in until the Civil War, so would have been well looked after. Cromwell did order then ‘slighted’ afterwards, as they had been Royalist strongholds, but they were never badly destroyed, like some (eg. Newark Castle, near to where I live, is just basically one wall, thanks to OC!). 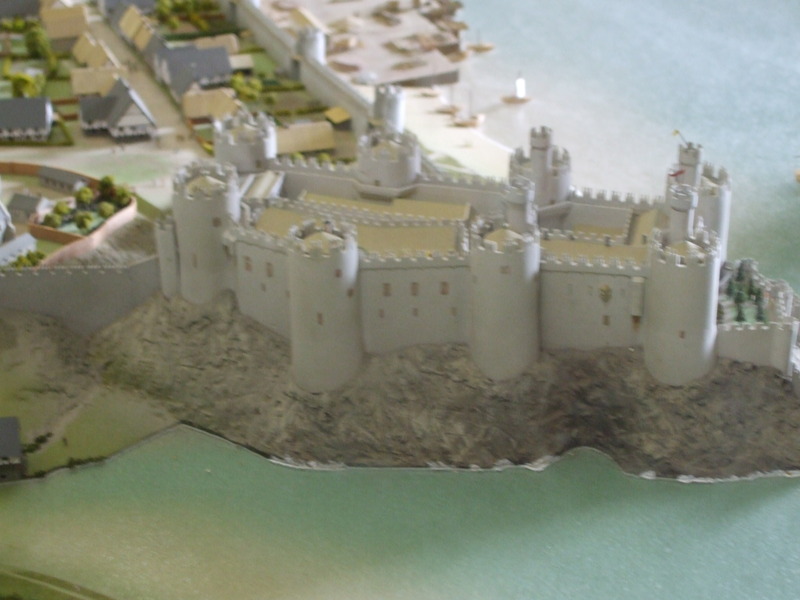 All the info about Conwy and Caernarfon go on about how well preserved they are. But look at the thickness of those walls! So strongly built – to keep out the Welsh! Wonderful! Now I want to go to Wales! Beautiful, Millie. Thank you for sharing. Looks like you had nice weather for your trip to Wales. Wonderful! That castle was awesome. Really enjoyed your pics and the history of the area. Understand, Millie. Can’t wait to see the other castles when you post. Been a challenging week around my place so haven’t been up on the computer a lot much less post a blog entry. Trying to get back on schedule. Still plugging along on Book 2 and other projects. (sigh); I’ll get there, eventually. Speaking of books, how’s your Book 3 coming along? My Book 3 is coming on a little more quickly now. It’s a challenging book, as so much happens in Wessex over the years the story will cover. I really could make two books out of it, but don’t want to do that. I know you haven’t posted in a while, so I imagined you were busy with your various projects. You seem to have moved a long way on from your earlier ‘procrastinating’ days. Good for you. All I can say is that I’m trying…honest! Around Castle Cotner there’s an adopted saying concerning writing: “There is no try. Only do or don’t do.” Grant you it’s just a motto and I’ve been known to wallow in the ‘don’t do’ more often than the ‘do’. (some might say the ‘do, do’…but I won’t go there. I’m enjoying your Book 2; can’t wait to read your Book 3. Those walls might be cold but they do tell stories. 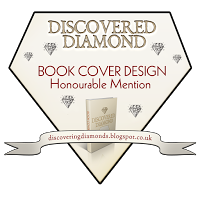 I so love these castles – hope I could visit them some day, but until then thanks to you for taking me on a blog tour Millie. 🙂 I can see where you get your inspiration from about your stories. I loved History and still do but hated to remember dates. On the other hand I’ve got unconditional love for Geography. Walking in the ruins stirs up imagination and when it is a castle or a fort you fell like falling back to that time and feel somewhat like royal or commoner or knight or whatever suits ones imagination. I’m a geogragher through and through. Geography and Geology are what I’ve done all my adult life. But History has a special fascination for me, and you’re right to say these old places are brilliant for inspiring stories and characters. I’m sure you have many wonderful sites in India. I’d love to see some of the old Mughal palaces and your fabulous temples. There are so many great places in the world to visit. Sadly, few of us can afford to globe trot! Geology – that’s new. Yes, we do have some marvelous places here. I love the idea when some people just take off to places for the love of travelling without thinking much about anything else. Excellent castle, Millie. Would make an excellent summer cottage. But I’m about two hundred years ahead of you with Wolf Hall (Mark Rylance as Thomas Cromwell). Really good. As for Wolf Hall… I’ve read it. I didn’t watch it when it was on TV though, which (from your opinion of the production) was a silly thing to do. Next time round, I think. The merriment of gulls wouldn’t bother me as I live by the ocean (in the ocean is a better description, but let’s not get hung up on small details). Frankly, I find it a little cramped. I like a place that can grow with you. Oh Millie, how could you, a history buff and Cromwell worshipper (p.s. I used the British spelling, just for you), have missed this fantastic adaptation? You will never be able to live this down. As for the TV series, I hang my head in shame for missing it. My excuse …? I haven’t got one. Next time round, as I said. I like the sound of gulls, too. I grew up by the sea and I miss their interminable screeching. My husband hates it – he’s an ‘inlander’. Thank you, Hena. It’s quite an awe-inspiring place. I just purchased ‘Shadow of the Raven.’ I feel good knowing that my small contribution (assuming Amazon doesn’t keep it all) will have helped to make possible your retirement in that quaint villa you liked so much, you know, the one by the Alhambra. Wow, Prateek, thank you so much for the mention! If anything, I’m really glad my Conwy post inspired you to write your own historical piece. It was a wonderful and inspirational post, and I learned a lot from it. That original, 5,000-year-old building is quite something. Just imagine what that ancient civilisation could have been like. It’s lovely to meet you, Millie. I found you through our friend, Prateek Kohli, and am enjoying your blog. Cheers and see you in the blogosphere:0).